THE MAGIC PORTION or STOP EATING SO FLIPPING MUCH! Okay, kids. It’s been a month since the last newsletter and, as usual, I cannot believe how time flies. But, here we are facing summer square in the face. And we all know what that means. That’s right. Let’s say it together, class, “Bathing suits, shorts, sleeveless tops, tank tops...” Basically, more skin and body parts showing than one can wave a stick at and speaking of waving…if you’re upper arms keep waving long after you’ve stopped, this newsletter holds much good advice and info for you. Plus, this issue just so happens to be the perfect sequel to last month’s newsletter. Coinkydink? I think not. You see my fellow fitness fiends, I have a sneaky little plan up my sleeves. That’s right. 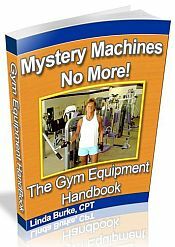 These newsletters will tie together neatly yet undetectably to make you, the innocent reader, more and more fitness savvy until you finally start making better and healthier lifestyle choices. Mwuahahaha! Dastardly, I know. I just can’t help myself. So, to recap: Last month’s newsletter was TEN TIPS TO FOSTER FAT LOSS FASTER. And if you recall, the very first two tips were PORTION CONTROL and EATING 5 OR 6 SMALL MEALS. So, I thought I’d use this newsletter to really talk about those portions and mini-meals (as I like to call them). No, really. 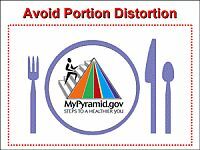 Not the portions most people eat, but the ones that the FDA is talking about in the Food Pyramid Guide. You know…the ones they are talking about in the very, very fine print on the nutrition labels that you should be reading. In fact, that’s a good subject for an upcoming newsletter, huh? How to read labels. But…I digress. Portions are probably one of the biggest culprits that are spoiling our weight loss efforts—shooting our horse in the leg before it even gets out of the gates running. Then we walk into the kitchen and we bypass the donuts and go for the grapefruit, a slice of wheat toast with scrambled egg whites, and OJ. We are feeling empowered and like the kings and queens of willpower and strength that we are! Then in about two hours it hits us. We begin to get hungry again. Now we are at our place of work. People have brought in our favorite foods and are waving them in our faces as we try to be strong and keep our reserve. What is this? It’s as if they want us to stay fat and unhappy, and they will do anything to keep us that way. BUT NO! We stay strong. We drink our water and turn the other cheek. We walk away from the temptation. Good for us! But, one problem lurks beneath the strong willpower and determination. We are hungry and getting hungrier. But we figure that just goes with the territory and we might as well get used to it. Now, two more hours pass. Whew! We made it to lunch. We are famished, so we get out the healthy lunch we packed this morning (an apple, tuna on whole wheat crackers, and a single pack of Brussels sprouts with half a cup of low-fat cottage cheese) and scarf it down. Not completely satisfied but a little appeased, we do notice that it is nice not to feel overstuffed like we used to after lunch. Back to work we go and everywhere we look people seem to be eating Snickers bars and peanut M&M’s and the dadgum donuts we didn’t eat for breakfast and after about 2 more hours we wonder why we are feeling resentful plus hungry. We drink more water and stay busy and make it through the rest of the day and finally it’s time to go home. We notice we are very irritable as we drive home and walk in the house and there they are again…the stinking donuts! We stay strong and fix a healthy dinner: Chicken and brown rice with broccoli and a nice salad. We figure it’s healthy and we’re starved so we eat double helpings of everything. An hour later we have half a carton of fat-free ice cream and a donut and go to bed feeling bloated and stuffed and hoping none of it counted since most of it was healthy food, right? Does this sound familiar? Anyone…anyone? IT DOESN’T HAVE TO BE THAT WAY!!!! Listen to me my weight loss wannabees! YOU CAN DO THIS!! Let’s take another look at the above scenario and make a few changes that will mean success instead of failure. Changes that will mean going to bed feeling good and sleeping well, knowing you made good choices and are one step closer to your weight loss goals. Sound good? Here we go. You did many things right. First, the breakfast was great! But the very first mistake you made was when you felt hungry two hours later, instead of turning the other cheek, you should have filled that baby cheekster with some good, wholesome food. That’s right. You need to eat every couple of hours. Fuel that body! Rev up that metabolism! Worse yet, you keep getting hungrier, more irritated, and weaker in every way until you finally cave at the very worst time that you possibly could, right before bed. So, I suggest the next time you have a mid-morning snack like maybe a low-fat yogurt and a piece of fruit. Now, two or three hours later at lunchtime, guess what? You sit down to eat your lunch and low and behold, you feel satiated as you get up and return to work. Not only that, but you have more energy. You don’t feel sluggish like you used to when you overate at lunch. Cool. A couple of hours pass and someone offers you some brownies she made the night before. There they are dripping with chocolate icing because she just pulled it out of the microwave. She offers it to you, saying she can get another because she brought plenty. It smells and looks sooooo good. But, you remember your goals. You remember how you want to look in your bathing suit and the commitment you made to yourself and your personal trainer. You politely decline the brownie and go to your snack that you packed especially anticipating this situation. You pull out your low-fat cottage cheese and pour the apple sauce on top as you sprinkle a touch of cinnamon and take a bite and think, yum. Then you wash your plum and take a bite and who knew plums were so good? Now two hours pass and it’s time to head home. As you are fixing your dinner it suddenly hits you: You feel good. You are not starving. You sit down to eat your grilled salmon, half a baked potato, green beans, and a salad and realize as you finish that you are satisfied and do not need seconds. Oh, you could eat more...but you remember to think about it and realize that eating more would be due to habit, not real hunger. Two hours later you have a handful of nuts and take a walk on the treadmill to ward off boredom eating. You go to bed a couple of hours later feeling proud that you ate healthy all day and you realize as you lay in bed that you never got hungry all day long. In fact, you were barely able to fit all the healthy food in the day that you had planned. Sounds too good to be true, I know. But I promise you this, if you follow this type of menu plan and take in the healthy amount of calories you should instead of overeating unhealthy, empty-calorie foods that most people gorge on, YOU WILL SEE RESULTS! Two things you must change: Your choice of foods and the amounts that you eat. These are the horse cripplers! You should be eating small meals consisting of high-fiber food along with healthy protein choices. A standard serving of chips is 1 ounce or 10 chips. That’s right 10. Almost as hard to eat as 1. A serving of meat is about the size of a deck of cards. A standard serving of a baked potato is about the size of your computer mouse. Think about that. A standard serving of pasta is about the size of a scoop of ice cream. Not the plateful you may be used to eating. Your thumb is about the size of 1 ounce of food. Your palm is about 3 ounces of food or 1 serving of meat. A small fist is about 1 cup or 8 ounces; hence, a portion of rice the size of your fist is about 3 servings. The tip of your thumb is about the same size as a teaspoon. The size of a tennis ball is a healthy serving of fruit. One ounce of cheese is the size of about 4 dice. Is it getting clear to you now just how out of control our servings have gotten? When the Food Pyramid Guide tells you to eat 6-11 servings of breads/grains, does it make a little more sense now? Servings are really quite small, not gargantuan amounts that we’ve become accustomed to consuming. and we should start thinking about the amounts of food we eat, as well as the nutritional quality. Maybe then we will actually have a fighting chance at not only getting out of the gait, but winning this race with enough energy left over to enjoy our lives. If you are tired of being sick and tired, and you want to start making real progress towards your fitness goals, then begin with these two changes in your diet. Control your portions and make healthier food choices, consuming 5-6 mini-meals daily, and you will be well on your way to fitting nicely into your summer wardrobe and proudly baring your skin. For more tips on living a healthy life, go to Straightforwardfitness.com. While you're there you may leave a message with questions, comments, or just to say hi on the "contact me" page. I would love to hear from you! Have your friends check out straightforwardfitness.com and sign up for this newsletter while they are there! Until the next newsletter, keep it real and keep the portions and food choices even more real. Work out regularly (strength train and cardio), drink lots of water, and eat plenty of fruits and veggies. Good luck! YOU CAN DO IT! !